For more information please call 864-643-0991 or contact us. Wilson Composites offers an infinite array of Fibertech cornice profiles in standard and custom configurations to suit the style and period of any project. 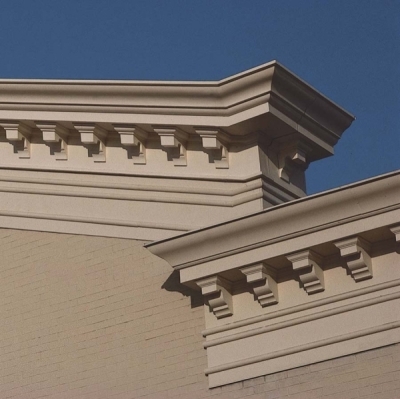 From the most dramatic overhang to the most elegant denticulation, Wilson Composites has the expertise to assist you in designing effective, aesthetically pleasing cornices for your specific installation. (FRP) is very lightweight. Therefore, it does not need much to hold it in place. At 2 lbs/sqft typically 8 LF of a 2Ft to 3Ft tall cornice will weigh about 60 lbs. So (FRP) can be handled by a single person instead of lifting equipment or cranes so installation from a boom or man-lift is a breeze. This also means that (FRP) can be used to remodel existing building facades that were not designed to carry the load of a stone or terra-cotta molding profile. The high impact strength of (FRP) offers durability where most architectural products fail. (GFRC) while more substantial, has it's own advantages. At 4-6 lbs/sqft (GFRC) is commonly used in conjunction with precast and cast stone facades, or columns and often used in new construction where the steel reinforcement of the (GFRC) panel can bee attached directly to your building structure. To ensure ease of installation and outstanding performance, all Fibertech components are supported by detailed shop drawings, SolidWorks 3d modeling, installation details and instructions, and experienced technical support from our own installation crews. Yankee Candle Hippodrome Performing Arts Center - South Bldg.